Pangolins have a similar shape to armadillos and anteaters. The African species are more specialized in almost every way than the Asian species. Males are usually larger than females, often 10-50% or more heavier. Pangolins are somewhat poik-ilothermic; that is, their body temperature directly varies with local temperature, with a low average body temperature of 89.9°F (32.2°C). towards the back of the animal. The number of scales remains the same throughout their life. When scales are lost due to wear they are replaced from the stratum germinativum (which provides for regeneration of cells) in the dermis (skin base). The process of scale replacement occurs when living cells (the epidermis) on the dermal papillae grow to the surface. The epidermis eventually cornifies (the converting of skin cells into horny material) in the depressions between the dermal papillae to make a loose stratum corneum. On top of and at the tip of the papillae, the processes of epidermal cornifica-tion lead to the formation of hard (horny) scales. The scales protect every body part except for the underside of the head and the sides of the face, throat and neck, stomach, inner sides of the limbs, and on the snout and chin (and in some species on the outer surfaces of the forelegs). During the night the color of the scales is good camouflage. The parts of the body that are without scales are thinly covered with hair. The hair coloration is whitish, pale brown to russet, or blackish, and the skin is grayish with a bluish or pinkish tinge in some areas. There are three or four hairs present at the base of each scale in the Asiatic species, but there are no hairs at the base of the scales in the African species. Pangolins possess small, short, but powerful limbs and each is tipped with sharp, clawed digits, with the middle digit being the largest. Their powerful front feet have large digging claws, while the shorter and stouter hind feet contain smaller claws. The digging claws of the front feet are folded upward so that the pangolins put down only the outsides of their soles. The limbs are used for digging into termite mounts and anthills. The terrestrial species also use their claws for scooping out underground burrows. In the arboreal species, the claw point grows over the finger and toe cushions. 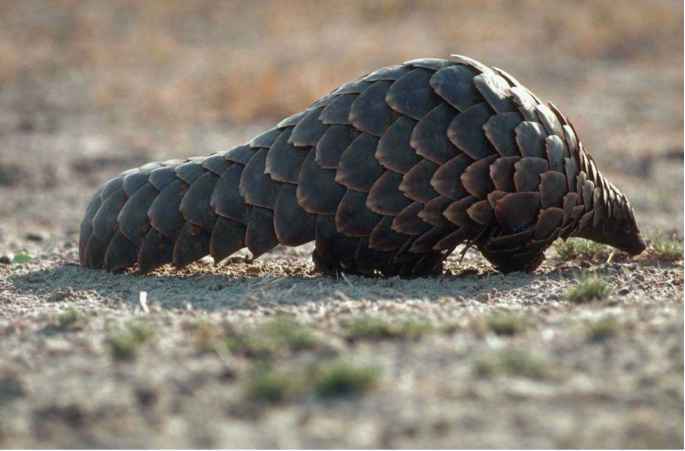 When running, all pangolins, whether arboreal or terrestrial, use primarily their hind legs. Terrestrial pangolins are able to move far distances in an erect position (without touching the ground with their front legs). In movement, they keep the body in a curved position; the tail is carried slightly above the ground and is used to maintain balance. Generally, arboreal pangolins have prehensile tails, while terrestrial ones possess semi-prehensile tails. which chewing muscles could be attached. The jaw contains no teeth (except for embryos that contain small primordial teeth, which eventually fall out). The underdeveloped halves of the lower jaw are reduced to thin strips of bone. 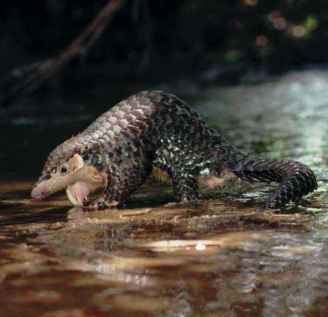 Pangolins are edenate; that is, instead of teeth, they use their tongue for foraging. The tongue is extraordinarily long and worm-like, and the salivary glands (which supplies the tongue with a tacky coating of saliva to which insects stick) are very large (measuring 22.0-24.5 in (360-400 cm) and are located in the chest. The tongue measures 6-7 in (16-18 cm) in the small species and about 16 in (40 cm) in the largest species, the giant pangolin. The tongue can be either round or flattened, depending on the particular species, and ends with a fine point. The tongue's average thickness is about 0.2 in (5 mm). When resting, the tongue is contained in a sheath supported by pliable cartilage rods that reaches from the back of the mouth to the pelvic region (the thoracic cavity) at the back of the lower belly. The muscles used by the tongue are attached to the xiphisternum (sternum). There are 11-16 thoracid (chest) vertebrae, 5-6 lumbar (loin) vertebrae, 2-4 sacral (pelvis) vertebrae, and 21-47 caudal (tail) vertebrae. The lumbar vertebrae do not have articular processes. Pangolins have neither a clavicle nor a collarbone. The muscular stomach is often called a "chewing apparatus" because pangolins swallow insects whole, where they are then chewed up in the stomach. This is accomplished in part by the stratified "pavement" epithelium, a horny skin layered (like pavement) on the posterior part of the stomach. Pangolins use this adaptation because the stomach must masticate the chitinous exoskeleton of insects (since they have no teeth in their mouths). Opposite to this epithelium is a muscular organ that is studded with horny teeth. Mucus glands and a large gastric gland also contribute to digestion. 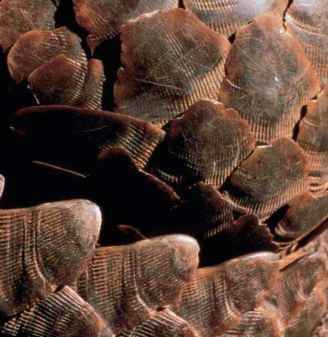 To also assist in digestion, pangolins swallow sand and stone bits in order to help the grinding action of the stomach. The sword-like process of the sternum has undergone a modification in all pangolins in order to accommodate the large elongation of the tongue. In the Asian species, the sternum is fairly long (resembling a shovel) and ends in a laterally broadened disc. In the ground species, it forms a long cartilage rod extending to behind the end of the rib cage. In the African arboreal species (the long-tailed pangolin and the tree pangolin), it consists of two very long cartilaginous rods extending outside the diaphragm, first toward the rear and then arcing toward the head again. The powerful tail is quite mobile, even though it is covered with scales. In the arboreal species it is considered fully prehensile (that is, it can be turned around either way, like a corkscrew) and is sometimes about twice the length of the body. The terrestrial species have a shorter, more blunt tail that is not considered fully prehensile. The mobility of tails assists the animals in climbing and supporting themselves when standing upright on the ground. The tail is sensitive at the tip, and can be hooked over a support such as a branch. It can also be used to strike out at an adversary, and when used along with its sharp scales can inflict much damage onto its enemies. state of pangolins. For example, the scents prevent aggressive males from approaching each other too closely, helps facilitate the locating of a mate, and are important in mother-young relationships. Males have a scrotum housed inside abdominal skin so as to avoid heat loss. Females possess two mammae with their auxiliary teats. The urine of pangolins has a pungent odor, and when dried it makes a whitish spot. The dung of pangolins is sausage-shaped and dry in texture. It is black in color when the diet consists mostly of ants, but brown when its main food is termites. Pangolins are often infested with external and internal parasites. grasslands, thick bush, wooded shrubby slopes, sandy areas, steppes, and open or savanna country. Whatever the area, it must contain ants and termites. 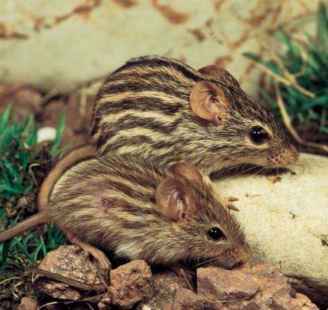 They are creatures who usually roam within individual territories, when known, of 38-63 acres (15-25 ha) for males and 8-10 acres (3-4 ha) for females. Ground burrows are about 5.9-7.9 in (15-20 cm) in diameter, usually attain a depth of about 8 ft (2.5 m), terminate in round chambers as much as 6.6 ft (2 m) in circumference, and generally are closed off with dirt when occupied. Arboreal pangolins regularly travel between the ground level and upper layers of the jungle canopy ranging from 5-20 ft (1.5-6.1 m) above ground. Does a pangolin have a clavicle(collar bone)?